The UBR boasts classic sound bar styling and has been designed to give your computer's audio playback a big boost. Built with dual premium drivers and a passive subwoofer, the UBR will help you enjoy your audio the way it was intended to be heard. It also features an innovative angled shape that directs sound up and towards your ears instead of directly at your chest. The slight tilt allows for louder, clearer stereo sound and a full-range audio experience every time. Space-Saving DesignThe UBR offers a luxurious black and grey design that perfectly complements your LCD or LED monitor. Thanks to its low-profile design, the UBR can tuck directly under your monitor screen, conveniently utilizing that wasted space and freeing up room on your desk. 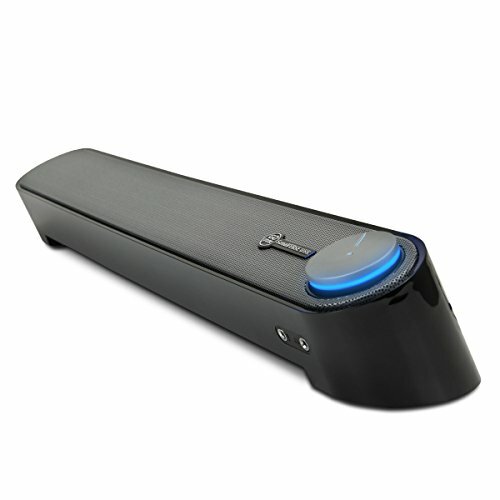 This ultra-compact stereo sound bar is the perfect alternative to the clutter and cables of desktop speakers. Turn the speaker on, off, and adjust volume with a single control dial, which (when on) is illuminated by a soothing blue LED indicator. To set up the speaker, just plug the USB power cable and the 3.5mm speaker and microphone jacks into your computer - there's no software to install or bulky AC power adapters to deal with. Forget bending over to plug in a pair of headphones or a mic, 3.5mm headphone and microphone ports are conveniently located on the front of the UBR. These ports allow you to plug a pair of headphones and microphone directly into the speaker and send audio data through the UBR to and from your computer.